Eric Cruickshank gains possession of the puck and takes it up the ice to Robert Morris’ zone on Feb. 18. Illinois fell to Robert Morris 3-2. The team holds optimism for next season. While it did not end with any tournament championships, Illinois hockey’s 2016-17 season was far more successful than the one preceding it. Illinois’ 2015-16 season had a few bright spots. 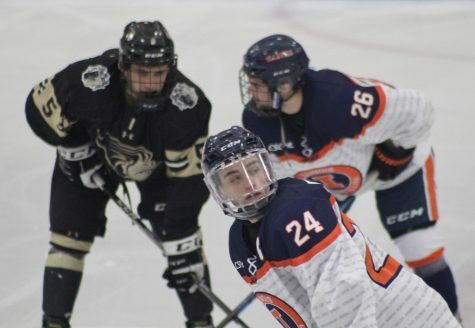 Forward James McGing led the Central States Collegiate Hockey League with 49 points, goalie Joe Olen won the conference’s Most Valuable Player honors and freshman defenseman Tyler Opilka was awarded the Central States Collegiate Hockey League’s All-Rookie Honors. It was disappointing, however, after a first-round exit in the American Collegiate Hockey League tournament. 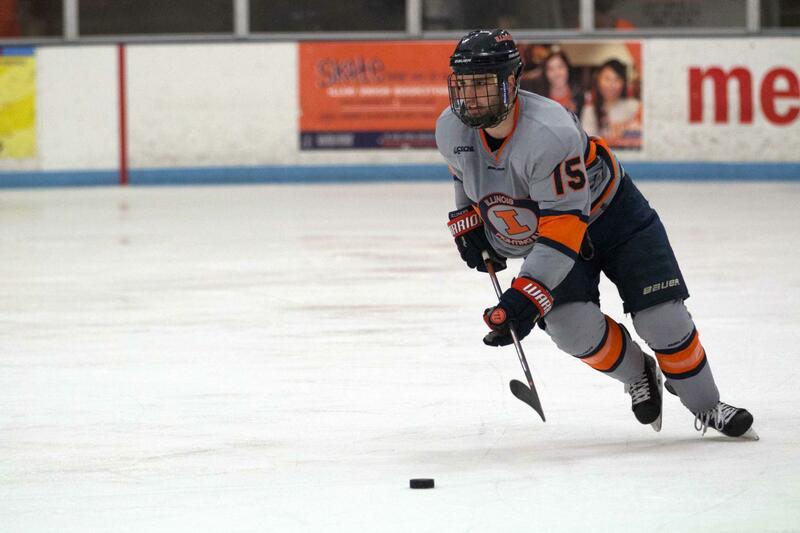 Illinois head coach Nick Fabbrini kick-started his fifth season with the program by naming junior defenseman Joey Ritondale the team’s captain. The Illini finished this season with a record of 23-11-3. They started fast by winning their first nine games before losing to Indiana Tech, 7-2, Oct. 15. Junior center Eric Cruickshank netted three goals in Illinois’ third game of the season against Michigan State. A native of Burlington, Ontario, Cruickshank was Illinois’ most consistent player this season with 23 goals and 45 points. A key to his success was cutting down his penalty minutes this year from his sophomore campaign. The loss to Indiana Tech started a rough patch for Illinois. Illinois picked up its first win against a top-tier school, rival Ohio, on Nov. 19. Freshman Mark Candotti scored the lone goal with less than three minutes remaining in the third period in a 1-0 victory. 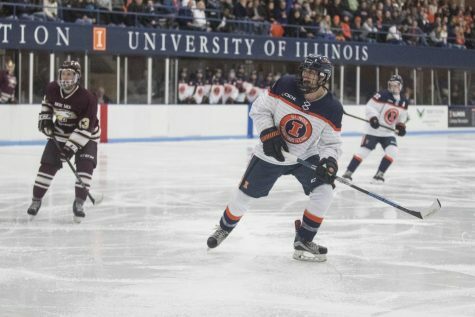 The Illini played their best weekend series of the season in Ames, Iowa, in mid-January when Illinois swept Iowa State. Junior goalie David Heflin tallied his second shutout of the season in a 3-0 win over the Cyclones on Jan. 14. Heflin started both games and stopped 92 of 93 shots over the weekend, including the 41-save shutout. 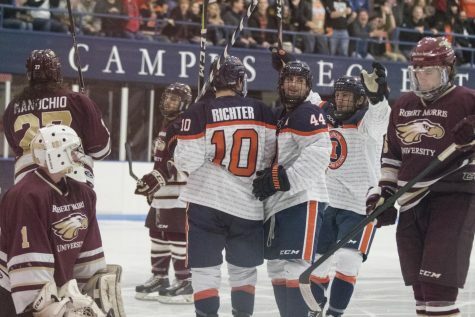 Illinois lost in the Central States Collegiate Hockey League tournament to Robert Morris for the second-straight year in February. 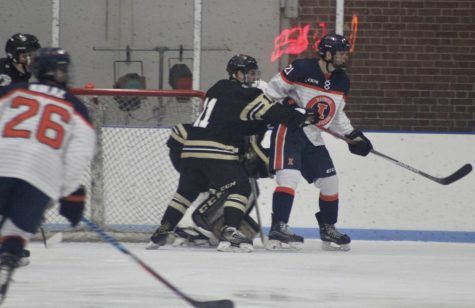 The Illini never recovered after falling behind 3-0 in the first period of the single-elimination playoffs. Illinois roared back with three second-period goals, but it inevitably fell, 5-4. 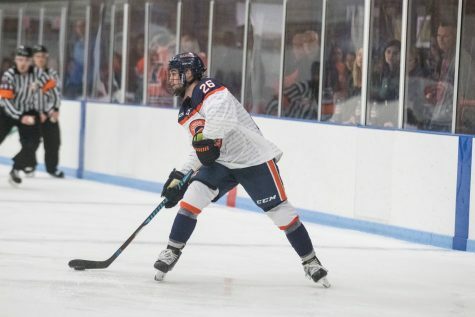 Forward David Kellner started on the top line for Illinois in place of McGing, who earned two unsportsmanlike majors in the Illini’s final regular season game. 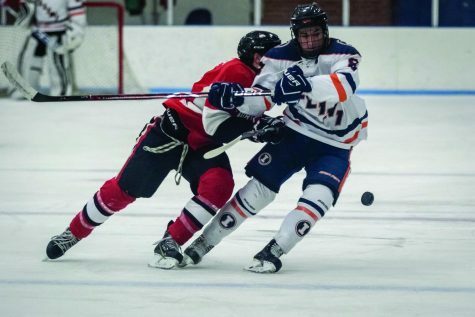 He was suspended for three games, including the CSCHL tournament. 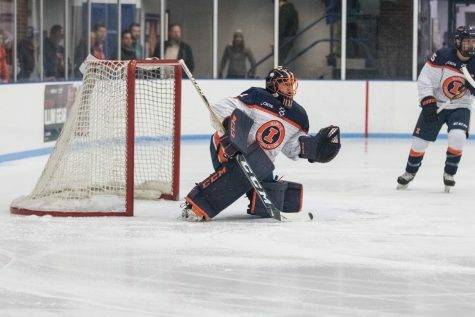 Despite losing in the Central States Collegiate Hockey League tournament, the Illini qualified for the American Collegiate Hockey League National Championships. Illinois defeated Drexel in the first round before losing to eventual-national champion Central Oklahoma in the second round, 7-3. Cruickshank and McGing scored shorthanded goals in the loss. Fabbrini handled a pair of rotating goalies for the majority of the season. Olen and Heflin started a majority of the second-semester games. This season was a breakout year for several freshmen, creating optimism for the program. Forwards Chance Homerin (11 goals, 22 points), Luke Forfar (10 goals, 25 points) and Bobby Ernsting (13 goals, 14 assists) are expected to be key contributors next season. 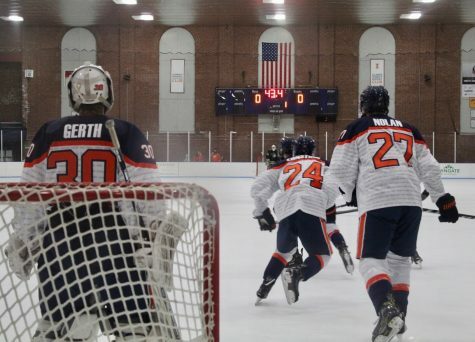 The Illinois Ice Arena is currently under construction, but it will be ready for the 2017-18 season when Cruickshank, McGing and Heflin attempt to raise Illinois’ first national championship banner since 2008.